Which cooker is right for you? The kitchen is often described as the heart of the home, and the centrepiece of most kitchens is a built-in or freestanding cooking appliance. As most of us spend so much time cooking, it’s important to make the right choice of cooking appliance to suit your home and lifestyle. We have produced this buying guide to help you make the right decision. Whether you’re replacing an old model or buying for the first time, this guide explains the most important things to consider and some of the features and technologies available in modern cookers, hobs and ovens. Which type of cooker is best suited to me? There are three types of cooker: gas, electric and dual fuel, which combines a gas hob and an electric oven. They come in a range of colours, sizes and styles, but as a baseline these are your main choices. Which type of cooker is best depends on your needs, taste and home setup. Some houses are completely electric. Some people prefer a gas hob for speed. Some people prefer no flame for safety reasons. For context, the most popular choice is dual fuel, as many believe you get the best of both worlds. Once you have decided on what style of cooker you want and what is appropriate, all you need to do is select a model that is the right size for your kitchen and family, in the right price range. Generally, the bigger your family and your kitchen, the bigger the cooker you’ll need. There are plenty more tips below, and if you need more help, pop in-store and one of our colleagues will be happy to guide you through the process. What is the difference between a gas, electric and dual-fuel cooker? A gas cooker runs on natural gas and has a naked flame on the hob. Many chefs prefer a gas-powered hob for speed and extra control over the cooking process. An electric cooker uses electricity to heat the oven and hotplates or rings on the stove. You don’t get as much instant control over the cooking temperature and it’s slightly slower to warm up, but there’s no naked flame or potential gas leaks to worry about. Dual fuel combines the two, as you get an electric-powered oven, with a gas-powered hob. It’s the most popular choice. And even if you don’t have access to a gas supply, many dual-fuel cookers come with an LPG conversion kit that lets you use gas bottles. How do I connect an electric cooker? To do this safely, you will need a qualified electrician to install your electric cooker for you. Luckily, we have a nationwide team of over 600 engineers, and install more cookers than anyone else in the UK. We’ll take care the entire process for you. Find out more here. Worktop cookers are a great choice for smaller apartments, as they let you cook but don’t take up too much space. If you have more space and a bigger family, then a large range cooker will be more appropriate. You can also get creative with how you use the space in your kitchen. Freestanding cookers fit snugly in between worktops. The best place to start if you want to do this is measuring the space you have, and then comparing it to your desired cooker. All you need to remember is to leave a small gap either side of the cooker for air to circulate. Another great tip is that if you love cooking, or cook often for a large family, go for a cooker with larger capacity. Many cookers have two ovens and a grill which is ideal for cooking lots of different dishes at once, or keeping certain dishes warm while others cook. A range cooker simply means any cooker that includes both a stove, for frying and boiling, and an oven, for roasting or baking. You can get gas-powered, electric, or dual fuel, which combines a gas stove with an electric oven. What are the benefits of buying a range cooker? 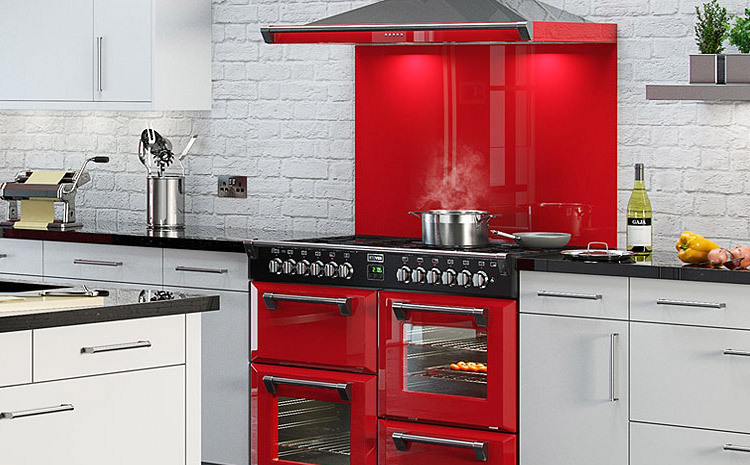 A range cooker is ideal for people who love to entertain and love to cook. Thanks to its numerous functions, you can bake, boil and roast at the same time, giving you extra freedom in the kitchen. How do I install a range cooker? To do this safely, you will need a qualified electrician to install your range cooker for you. Luckily, we have a nationwide team of over 600 engineers, and install more cookers than anyone else in the UK. We’ll take care the entire process for you. Find out more here. Do you have to use special pans on an induction hob? Yes. Your pans will need to have a base that contains iron, which makes the pan magnetic. Pans that work on an induction hob are sometimes referred to as containing ferrous metal, which simply means it contains iron and is therefore magnetic. To test this, put a magnet on the bottom of your pan and if it sticks, it’s good to go. Why is induction cooking better? Induction cooking heats cookware faster, which cuts the cooking time. They're also safer, as the surface stays cool to the touch and the burners turn off automatically when the cookware is removed. They're easier to clean and spills don't stain by getting cooked onto the hob’s smooth ceramic surfaces. Please be aware that if you have a pacemaker, an induction hob isn't a suitable choice for your home as it uses magnets. We have a range of electric and gas hobs that are suitable for use with pacemakers. Do gas hobs need electricity? Yes. While it draws a fraction of the current as an electric cooker, a gas oven still requires small amounts of electricity for running the gas igniter and accessories such as a clock or oven light. What is a freestanding range cooker? A range cooker includes both an oven for roasting or baking and a stove for frying or boiling. Freestanding means you can move it anywhere in your kitchen and it doesn’t require any cabinetry work. It’s the most common range cooker you will find on the market. It’s not built-in to a wall or structure, which means you can move it to a new house or redesign your kitchen. Which features should I look for in a freestanding cooker? Look for features that let you cook in different ways at the same time, such as a combined grill and oven. A lot of electric cookers also come with two ovens, where one is fitted with a fan to evenly spread heat and cook faster while the other has heating elements at the top and bottom. This lets you keep food warm before serving while other foods cook in the fan oven. Which width of freestanding cooker is right for me? Freestanding cookers come in 3 widths; 50 inches, 55 inches and 60 inches. The width is what determines the cooker’s capacity and how much you can cook. You’ll need to find a cooker that both fits in your kitchen, with an inch or so gap either side for air flow, and that can meet the demands of your family. Do free standing cookers require installation? Yes. To do this safely, you will need a qualified electrician to install your cooker for you. Luckily, we have a nationwide team of over 600 engineers, and install more cookers than anyone else in the UK. We’ll take care the entire process for you. Find out more here. A hood is a suction or fan device that hangs above the stove in your kitchen. You can get extractor hoods, exhaust hoods or range hoods, which all filter grease, fumes, smoke, heat and steam from the air while you’re cooking. How do I install a hood? To do this safely, you will need a qualified electrician to install your hood for you.